It's that time of year, gang! Gratefully, this is when 'Ohana shoots start to fill up my calendar until the end of the year. Much to my delight, there are families who have turned their picture taking sessions into an annual event. And then there are families who are brand new to a professional portrait session. Usually there is one main question that is mind boggling to the moms (who are the ones usually in charge and requesting that this event take place much to the chagrin of her brood). And the question is..."What in the world do we wear????!!!!" It's really quite simple and doesn't require you going out to purchase a new wardrobe for your photo session. The key word here is simple! The solids really help to break up the design. This is also visually pleasing to the eye when you throw your images into Black and White or Sepia like this photo of mom and her two boys. Now, with a family of maybe two to six members it's pretty easy to coordinate attire. It does become a little trickier when you have several families getting together to take a photo. Again, the same suggestion applies, keep it simple! For the big group shot, everyone can wear the same color scheme. And then later, when the families are broken down into groupings they can wear their own color. Even in Black and White it looks pretty cool! This shot works with Kex's shirt having a design because it's subtle and his parents complimented it in solids. Okay, hopefully this will at least give you an idea of how to deal with the wardrobe quandary for your photo shoot. Just keep it simple and you'll be fine!!! Seriously folks, it's really all about the fun and the LOVE!!! MAHALO NUI LOA for popping by!!! 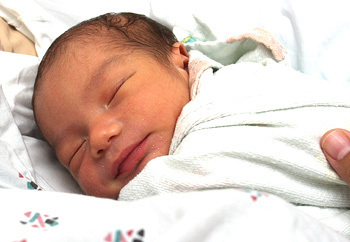 On my way out to the West side for my evening 'ohana shoot, I stopped by another special 'ohana's home to meet my new one month old nephew, La'iku. As you all know by now, Tiara and Brian are my former clients who's wedding I photographed back in 2003. Gosh! Time sure has flown by...and here we we are still friends and now an auntie to their son! I gifted La'iku a beautiful green Ti plant in hopes that Tiara and Brian will plant it in honor of their adorable first born. I love the green Ti! It is my FAVORITE plant! In the Hawaiian culture it is a sacred, powerful, extremely useful plant. 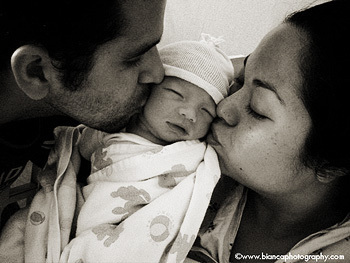 Congratulations, Tiara, Brian and to the Lee and Gustilo 'ohana! Oh how I look forward to continuing this journey with all of you!!! Early rise and shine today! On the morning agenda was a sunrise shoot in Lanikai with a cute one and a half year old. 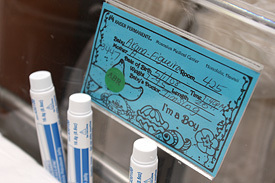 His parents were redeeming a gift certificate they had received. Yes, folks, I have gift certificates available and it really is a one-of-a-kind and unique gift!!! Meet Little Red Boots and his red rubber boots! When I first saw Little Red Boots (I'll call him LRB for short) with those red boots I just about fell over! He was so cute AND proud of his boots! How many of you had a pair of those boots as a toddler? It brought back so many fond memories. I was happy to find that they still make them! When you have red rubber boots you're always tempted to jump around in a puddle. No matter how small the puddle is. Nice time for a walk on the beach with mommy and daddy. You know what's so cute? Later during our shoot I found out that it was mommy's birthday! Happy birthday mommy!!! Toddlers who love the water know where the action is! Sometimes one just wants to play in the water! Not take photos!!! So off to the water he goes! At this point, daddy has gone to get swimming attire. Yup, Little Red Boots abandoned his red rubber boots! Now, this is more like it!!! I thought that maybe he was too tired to shoot in the park. I was soooo impressed with LRB still being in a happy and playful mood! So here we are at a nearby park all gussied up and armed with his Lightening McQueen ball. You know what's so cool? A lot of times, FIRST TIMES happen during my shoots with toddlers. For instance, this is the first time that LRB sat in a playground swing! You can tell that he was brand new to the experience. The thrill lasted for only a brief moment though. It was pretty neat to be there to capture his first time in a swing! Then we were both distracted by this beautiful chicken. Thank you Little Red Boots for a wonderful shoot this morning!!! I'm sure that this was a great way for mommy to start her birthday!!! I LOVE living in Hawai'i. I most of all I LOVE living on the Windward side of O'ahu! 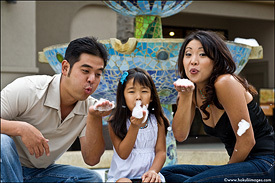 If my clients are from the Windward side there's a good chance that they'll want to shoot in their home town. You can't go wrong with the Ko'olau Mountains as your backdrop. Meet Michelle, Mat and their two little Monchichis. 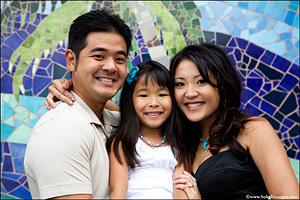 I was referred to this lovely family by my friend (and talented videographer), Reggie Dela Cruz of Heart to Heart Video. With her, you guessed it, MONCHICHI!!! Sometimes it super comical trying to get two siblings in this age range to come together. Let alone stand or sit still and SMILE! Makamae and Maika did an awesome job! After getting the sibling shots its time for the solos. The best shots to me are always when the kids are allowed to just be...which normally means a lot of chasing and running around for everyone involved! And sometimes, they just need to take a break! 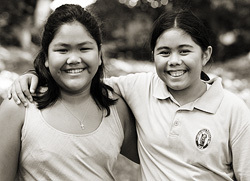 MAHALO NUI LOA to Mat, Michelle, Maika and Makamae for a wonderful 'ohana shoot on the Windward side! And to Makamae, I LOVED meeting your Monchichi. It brings back fond memories for me. I love the Monchichi song! Gotta love our island keikis!!! The next stop on my 11/11 journey, takes me to a special bamboo forest with three special little kids. Yes, it was time for the annual holiday photo with Carlene and Ian's keikis! Last year's shoot was at Diamond Head Beach. The kids have grown quite a bit and are as cute as ever! I was sooo impressed with Flora's climbing skills! And like his sister is a great climber! And then there's our little Matilda...she always makes me smile!!! Again, so glad that they're canine siblings could make it this year to join in on the fun! Despite the rain we were able to capture everyone's smiles and had a great time together. 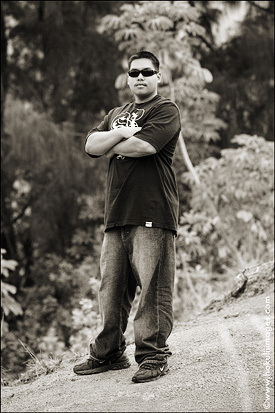 MAHALO to Carlene, Ian, Bertha and the entire clan for another fun shoot!!! See you again next year, gang! Time for Holiday Photos Peeps!!! The Beltran 'Ohana really rocked it at Makapu'u this afternoon! What a fun loving family! Despite the humidity that caused us all to sweat, it was picture perfect weather at one of my favorite O'ahu spots. MAHALO NUI LOA to the Beltrans! The first day of the last month of the year! And what a great way to welcome the month! This morning I had my first shoot at Lanikai Beach. 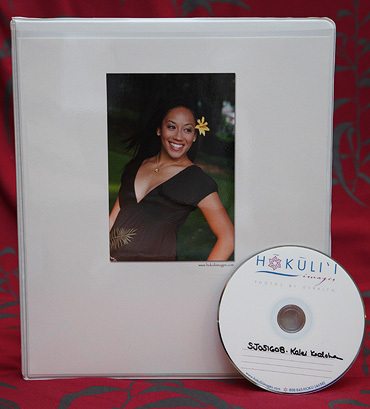 My good friend Nani Corpuz Ho purchased an 'Ohana Li'i photo session for her sister, Lehua, for Christmas. 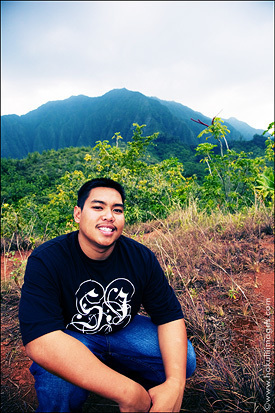 Lehua's husband, Danny is back in our islands for only 18 days and will be returning to Iraq on the 6th of this month. I met Lehua, Danny and their 2.5 year old son, Kainoa, at the Kailua Boat Ramp. I then lead them to one of my favorite spots at nearby Lanikai Beach. This is the first time I'd be meeting Kainoa since he was only in his mommy's tummy when I met him at Nani and Mike's wedding in 2005. Sometimes, it takes a little while for young ones to warm up for their shoot especially if they've gotten up at an usually earlier time than normal. It didn't take too long for Kainoa to start getting into it! In true local boy fashion, he was happy to be able to take advantage of the beach time with his mommy and daddy. This makes for a very happy Kainoa! And of course, it doesn't just stop here! What makes Kainoa really, REALLY happy???? Yep! Now that's a local boy for you!!! Even daddy got into the act! What a really great way to start this December morning! MAHALO Nani, Lehua, Danny and most especially Kainoa!!! 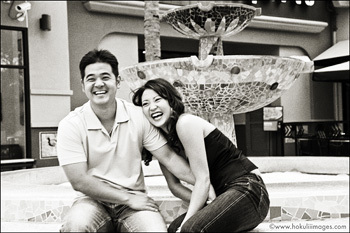 Back in March of 2005, I had the great pleasure of photographing Alison Won and Tyler Tanigawa. 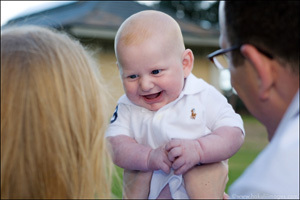 Fast forward to 2008 and I am now photographing their first born son, Shea who just turned ONE! What a pleasure to see my couple turn into an 'ohana. I love photographing toddlers on their parent's shoulders. This is just a snippit of time, folks. Before you know it, Shea is 16 and won't be riding on anyone's shoulders!!! Because it was so windy on the beach front at Kailua Boat Ramp, I decided to move the shoot into the park as infants and toddlers get very fussy after while. There's only so much one can take of being blasted by salt air! Shea was completely fascinated by the leaves of the Iron Wood trees. It made him so happy!!! Another change of clothing for Shea! Hmmmm...colorful blocks in the park? Okay, as long as there's a little bit of Iron Wood leaves to go along with it! Shea LOVES knocking down his blocks! Thank you, Shea, for a wonderful morning! Happy ONE year! 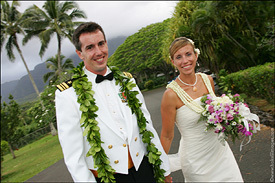 Several years ago I photographed Jessica Ke'ala Kim and Ryan Campuspos' wedding at Luana Hills. I remember that colorful wedding like it was yesterday! I recently had the great pleasure of seeing them again and meeting their fun two year old, Dylan Kalahikiola or "Kala" as he is lovingly called. 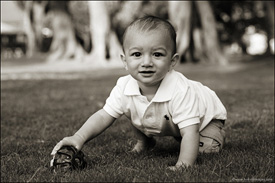 We chose my favorite park, Nu'uanu Valley Park, to capture this two year old in action. It didn't take long for Kala to get his feet warmed up! Yes, parents, this is a normal reaction for a well rested two year old in a park! For some reason, during my photo shoots, kids do have the tendency to introduce new ways of expressing themselves much to chagrin of their parents! Another thing we caught him doing was playfully throwing things. Fortunately, quick moving Auntie G ducked away in time before a collision occurred with her head! Kala did sit still for a few photos. This one is dedicated to his Auntie Jaclyn! See Auntie J? I asked Kala to smile for you and he did just that! I just LOVE his cheeks!!! Oh! BTW...I just LOVE little people's Crocs! Kala and his parents were so sweet to give me a little gift! I was sooooo honored to receive my own Kalahikiola shirt which was designed by his talented mommy, Ke'ala! I am going to write more about this special print in another post. It's really cool!!! As you can see, Kala has changed into his "second look." OMG!!! There's that tongue again! Umm...does this look like someone familiar??? After a while, daddy got into the act! He was on such a high that changing him was a little challenging and funny for mommy!!! And there's that tongue again!!! I love that he's showing mommy how to smile! 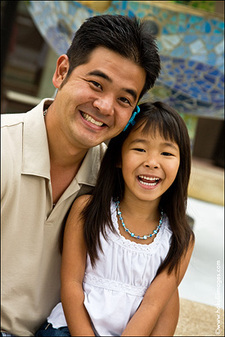 Ryan and Ke'ala, MAHALO NUI LOA for allowing me to document your little ray of sunshine!!! I can't wait to see you all again!!! I love shooting at Diamond Head Beach (I think that's what it's called) during this time of the year! So I was absolutely thrilled to receive a call from one of my dear clients, Carlene and Ian. I've enjoyed shooting Carlene and Ian's three beautiful children through the years. They each have their own personality and cuteness! Even their canine family members got in the act! 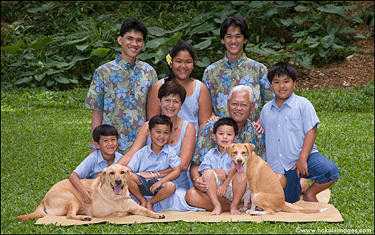 MAHALO NUI LOA to Carlene and Ian for calling upon me to photograph their 'ohana photos for this year's holiday cards!!! I had such a great time with all of you! And it really helped that we had some special people helping out during the shoot. It was so heartwarming to see how much these kids LOVE their auntie!! And vice versa!!! 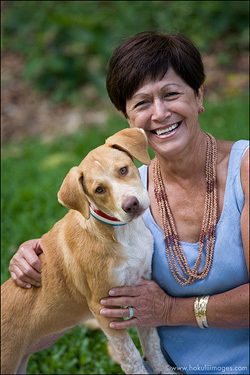 Thank you to Sabrina Clark of Balance Obedience who's been training Coogie and Ditchy! She and her assistant, Danny, were awesome. Please visit their website for more information. Thank you also to Bertha for her helping hands and jumping skills in making the kids laugh! I look forward to seeing all of you again next year! This time of the year is so fun for me because I get to see a lot of my 'ohana clients. Yes, holiday photos have officially started! 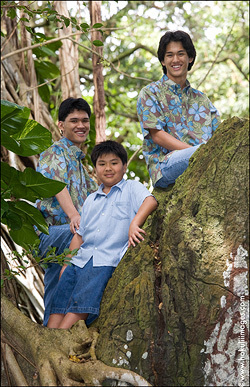 This Sunday afternoon at the park, Nu'uanu Park to be exact, I hooked up with the Miyasatos. I actually met this cute family back in 2006 at Ralynn and Dean's wedding. Maddux was their ring bearer! Okay, so he wasn't too happy during our shoot but today he was totally ON!!! Since the wedding, I've had the great fortune of becoming friends with Maddux, his parents and new baby brother! The boys have grown since last year's holiday shoot! I'm wasn't surprised to find out that they are both into baseball. Maddux really adores and loves his little brother Kendall. Oh! And let's not forget mommy and daddy! MAHALO, Miyasatos for a fun time at Nu'uanu Valley Park!! 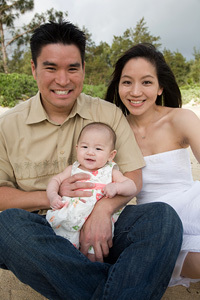 Today I ventured out to the West side of O'ahu to photograph the Takahashi family at Paradise Cove's public beach. Back in December of 2003, I photographed Sarah and Jeff's wedding at Paradise Cove. I remember them being such a wonderfully cute couple! And as of today, they're still as cute as ever!!! Actually, I think they've matured beautifully as they are now PARENTS!!! And their second son, Rylan, who just turned one last month! Now we have the Takahashi 'Ohana!!! Most of the time, when I work with keikis that are under the age of five you have to work with their agenda. Okay...what would be more interesting to you as a 13 month old??? Auntie with a camera in your face? or cute little brown Labrador puppy running all over the beach??? Yes, he's got the right idea. I, too, would be more into the latter. This wasn't quite the look we were looking for however, kudos to Rylan and Dylan for already knowing the different forms of transportation that exists in our world!!! When one is engaged in an activity and the other one is blatantly saying, "I'm NOT interested!!!" I just roll with it! While Mr. Rylan was happy being independent and free!!! Sarah called me for this special photo session for mainly two reasons. Firstly, being Rylan's first year portrait and secondly (not my favorite reason), that they will be relocating to California by the end of this month to be closer to their families. 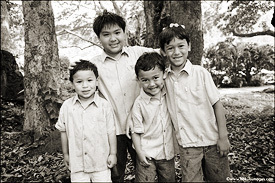 MAHALO NUI LOA, Sarah, Jeff, Dylan and Rylan for allowing me to document all of you in this very special place. 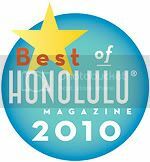 I look forward to seeing all of you again when you return to O'ahu for a visit! In the meantime, I wish you prosperity, joy and success in your new chapter of life in California!!! 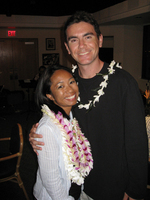 Back in October 2005, Stacey and Jennifer Nakamura tied the knot at the Bernice Pauahi Bishop Memorial Chapel. That was a super fun wedding!!! I recently received a call from Stacey asking me if I could be of service to them again. This time it was for a family reunion to celebrate his mom's side of the family. From there they created this lovely bunch! This was photographed this afternoon in Kane'ohe. 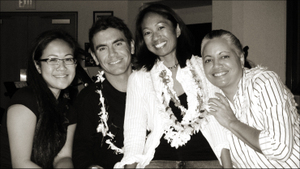 The Apao 'ohana was so much fun to hang out with! And look at that awesome backdrop!!! I can never ever get tired of the Ko'olau Mountain Range!! Yes! Stacey and Jenn have a 2 month old son named Blake!!! Welcome HOME, Blakey Boy!!! Here's Blake being held by his Auntie Melissa while his Auntie Melanie makes him smile. He knows when he's being loved on!!! And here's Popo with all her GREAT grandchildren! What a legacy that she and gung-gung have created!! And check this out!!! Might I add that this has got to be my No Ka Oi shot for today?? Meet Mr. Smoki Cuddle Bugs Wong!!! I think you'd agree with me that he's pretty dang cute and handsome!!! I'm so glad to have had the great opportunity to photograph Stacey's mom's side of the family today. It was so nice being with such a loving clan, right here in Kane'ohe, at a backyard country style get together. Great people & ONO food (Mahalo Uncle Darrel for that killah beef stew!!!). MAHALO NUI LOA to the Apaos, Nakamuras, Kongs, Wongs, and Kawahakuis!!! It was an honor to document your 'ohana!!! Mahalo Iverne for this photo of me and the Apao women! I will treasure this image!!! PS. 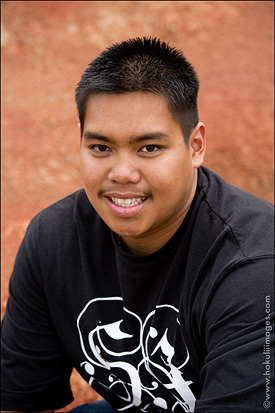 Mahalo, Stacey and Jenn for allowing me to be a part of your 'ohana again. And a big MAHALO to you, Stace, and Uncle Danny, for building the coolest "home-style bleachers!" 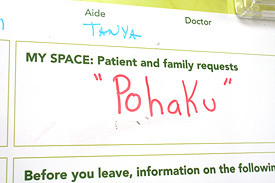 Without your foresight and kokua, that wonderful 'ohana nui shot wouldn't have turned out as awesome!!! Your Auntie Rhino LOVES YOU!!! Ishaan Takes On Waikiki Beach! Last week Wednesday, before my Morning Figs with the Figs, I headed out to Waikiki for a 6:45am shoot with the Parate 'Ohana who was visiting from the mainland. 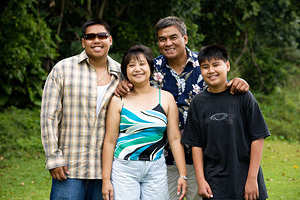 The Parates were coming to the end of their fun-filled, relaxing stay on O'ahu. They wanted to have their four year old son documented on the beach before they returned to California. I introduce to you, Ishaan! Oh my gosh!!! Isn't he the cutest?!?!? 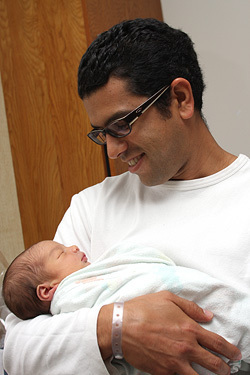 And his handsome daddy, Nilesh! I can understand why I received the call from Joycie to do this shoot. He can't resist to show me what he's discovered! Even with the change of clothing, Ishaan didn't skip a beat! He saw something in the water! NEVER doubt a kid when they say they've seen something because they've got eagle eyes! They can zone in on things that, at first, is very difficult to see (for a mature adult like myself). Wouldn't you know it! There was a school of little guppies swimming around! Which of course means, more joy! I really love the way the SOFT morning light is illuminating Ishaan. It accentuates the joy that he's feeling, doesn't it? It helps, of course, when mommy and daddy gets into the act too. It makes Ishaan REALLY happy!!! I LOVE, LOVE, LOVE when parents allow their children to just "be." The perfect photo to me is when a child is perfectly content. And that would sometimes mean allowing them to get wet and sandy! And when the parents are just as involved in the activity, that's perfection at it's best! Just being a family - together, having fun!!! Let's not forget that mommies and daddies out there!!! 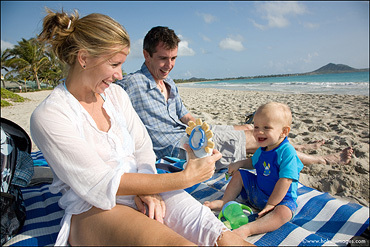 MAHALO, Joycie and Nilesh, for asking me to document your son's love of the sand and surf on our beautiful island!!! He's such a sweet and beautiful boy! He radiates the love that the two of you share with him and with all the people you meet along the way. It is an honor know you!!! and for being so impressively gung ho with life so early in the morning!!! I can't wait to see you again!!! 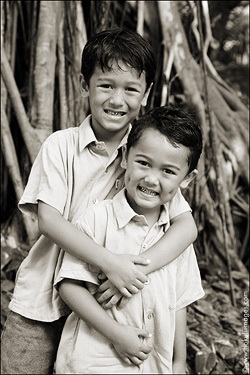 This evening I took a drive out to Kailua to meet the Hoang 'Ohana for their photoshoot. They're visiting from California. So this evening, I got to photograph Lisa, Ky, Ryan and James in Lanikai! 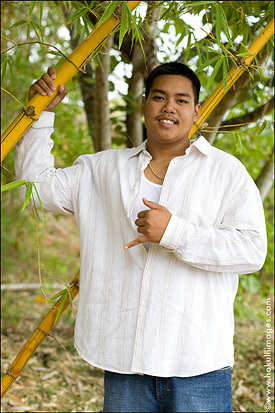 MAHALO, Dori and Shawn for entrusting me to photograph your friend's 'ohana during their stay on O'ahu! And a BIG MAHALO to Kim and Bart for starting a wonderful trend amongst their cool friends!!! Happy One Week, Mr. & Mrs. Cooper!!! One week ago from today, Lauren and Russell tied the knot at the Saints Constantine and Helen Greek Orthodox Church in Honolulu. 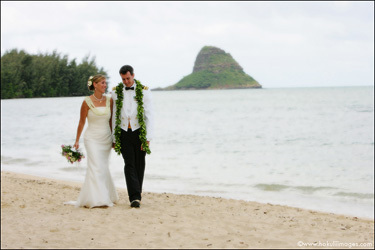 With their bus load of guests, the new Mr. & Mrs. Cooper were off to The Kahala Resort for their celebration!!! I'm thinking from now on, for each wedding post I do, I'd like to include a few of my favorite things from each event. Just some neat and creative things, thoughts or people that I'd like to share with you. Working with Fran, Lauren's mom. MAHALO for being so organized and detail oriented, Fran!!! The Wedding Party's attire - island style, COOL and comfortable!!! Custom designed by Princess Kaiulani Fashions. Lauren's Pronovias designer dress is from Casablanca Bridal Salon in Honolulu. Lauren and Russell's laid back and fun way of being! They had everyone laughing and clapping throughout the day. 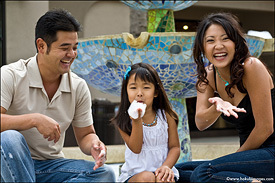 The Kahala Resort's - Grace Chan! She is one of my most favorite on-site coordinators along with her amazing, hardworking staff! Again, congratulations to the Hallonquist and Cooper families!!! MAHALO for a wonderful event!!! Independent Twins on Independence Day!!! Ethan and Ren spent their early July 4th morning at a photo shoot with their Mommy Deena, Daddy Reed, Grandma Gloria and Grandpa Taka. Happy NINE years, Mr. & Mrs. Nagtalon!!! I met Desiree and Eugene back in 1999. I photographed their engagement photos. My time has flown!!! Today, they asked me to shoot their fourth child's one year photo. 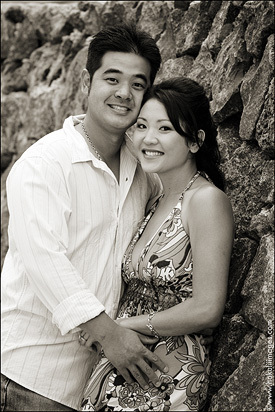 It was during the shoot that I discovered today is Desiree and Eugene's NINE year anniversary!!! So Happy Anni, Eugene and Desiree!!! I hope you both enjoyed your special day together!!! This afternoon, I was called upon by my very good friend Phil, to document his wild and fun 'ohana. Most of them are visiting from the mainland to help celebrate his 20+30!!! Little Mr. Ahu is turning ONE!!! This upcoming Sunday, 6/22/08, Alika is turning one!!! Yesterday, I had the great fortune of photographing him with his beautiful parents. This afternoon, I had the pleasure of working with Bacchus the Bull Mastiff and his parents Lauren and Russell. Today's shoot was actually an engagement session but as you can imagine, this handsome canine took over the show!!! Tate turned THREE yesterday! And every year, one of the activities she does to celebrate her additional year of life is to have a formal photo session. I've had the great honor of photographing this vivacious child for two years now. During our ENTIRE photo session yesterday she kept me laughing!!! She's like a little comedian with her quirky antics. I can tell she LOVES to make people smile! 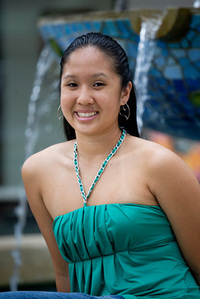 Mahalo to Kanani's 'Ohana, the Pangs, for a fun-filled photo shoot at Kakaako Waterfront Park this afternoon!!! Another long awaited shoot! I really enjoy my time with the Stoebners. This entire family is sooooo loving!!! I love to watch (and document) the interaction between the siblings. All girls, including their delightful little brother, are so great with each other! MAHALO Nui Loa, Stoebners! I can't wait to see you all again!!! It seems like it was only yesterday when Justin was filling up his father's Nissan Pulsar with water from a hose. A five year old's attempt to help wash the car! And here he is, practically a grown man! It took just a little bit for Justin to get warmed up. After several clicks of my shutter, he was ready to roll!!! Brenden, thank you for making your big brother smile!!! 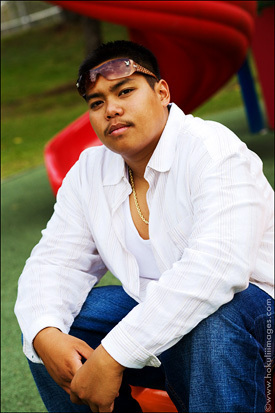 And MAHALO for assisting me during this shoot. In no time, you'll be on the opposite end of my lens. 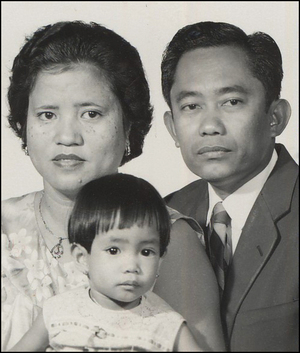 M. Rey & M. Lita, thank you for being wonderful, hardworking parents. You both deserve a couple of Mai-Tais!!! My godson, Justin, I think I can speak for the entire clan when I say, we are so dang proud of you!!! Today, Little Kai turned ONE! He started his big day out at one of his favorite places to be - the beach!!! Before I go on, I need to share with you that Kai's parents are Louise and Greg. I photographed their wedding back on April 28, 2006 which of course means it's going to be their TWO YEAR Anniversary tomorrow! So Happy Anniversary, Louise and Greg!!! 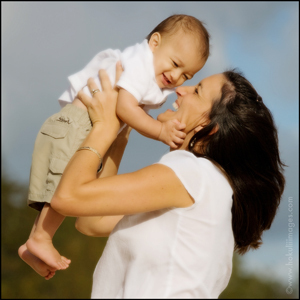 I was so thrilled to receive a call from Louise to let me know they had a baby boy who they lovingly named Kai. And what an appropriate name that is! Kai, in the Hawaiian language/first definition, means "sea, sea water." His name is so befitting as Kai LOVES THE WATER!!! 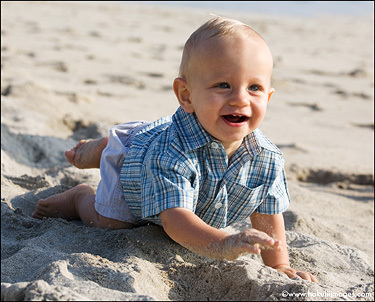 Every time his parents would put him in the sand, he directed himself toward the ocean and off he'd go!!! It was quite amazing to watch him crawl like a sand crab toward the water. FAST and very efficient! During these Piko Shoots, I highly encourage my clients to bring their baby's favorite toy and snacks. When Kai had a little break he got his mum-mum and his favorite toy, a stuffed little lion which Louise knew would make him soooo happy! I really enjoy watching my clients being parents. When I first met them they were without their Little Prince and now, it's as if this child has been with them for forever!!! Even when it was time for Kai to wash off, he soaked up every moment with any form of water!!! 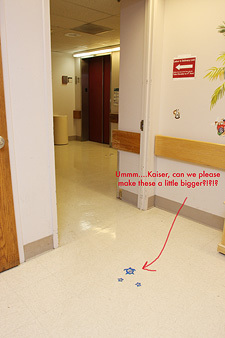 ...and of course, finally meeting your intrepid Little Prince! 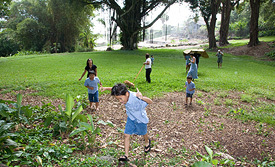 I spent a couple of hours this afternoon at Nu'uanu Park with yet another lovely family - The Aki 'Ohana. My friend Kahau called me to see if I could photograph her parents with all their mo'opuna (grandchildren) including the canine kids. Not even a little bit of drizzle could stop the fun! Their family has certainly grown!!! 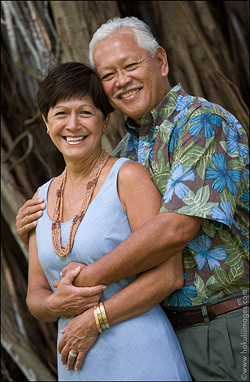 And we can thank these two beautiful Hawaiians for this wonderful 'ohana!!! 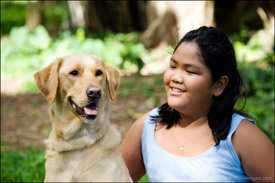 Special MAHALO goes out to my faithful assistant and niece, "Kokua." You were such a great help, kiddo! THANK YOU!!! So what is a Proof Catalog??? Now here's a really good question. I get asked this a lot! Along with, "Is your dog a Labrador???" If you look at my packages, you'll find that your photo session also comes with what's called the Proof Catalog. As you can see here, it's basically your images laid out like a "contact sheet." Below each image is the file number that corresponds to the HIGH RESOLUTION image files on your DVD or CDs. It's easy to show off your photos to your family and friends this way. 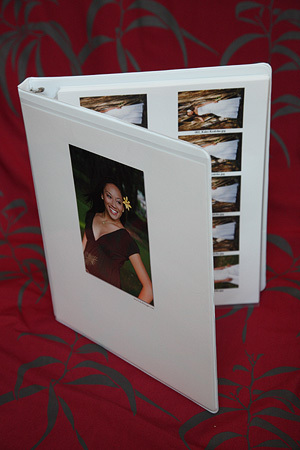 All the "contact sheets" are placed in acid-free sheet protectors which go in an archival binder. HPP (as we pros lovingly call it) has been handling all my photo lab needs since I started back in da day. They are the bestest in da Westest!!! Adventures with Ilima, Derek & Teylie! After reviewing my blog, I hope you're getting the feel of what's important for me and my clients on my shoots - the element of comfort and FUN!!! 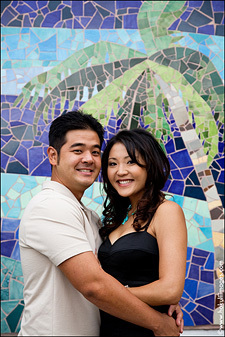 About two weeks ago it was time to photograph one of my most favorite 2008 couples, Ilima and Derek. Their wedding is coming up in June. So it was time to do their Pilialoha or engagement session. Ilima and Derek brought along Derek's darling daughter, Teylie, to join in on the action. 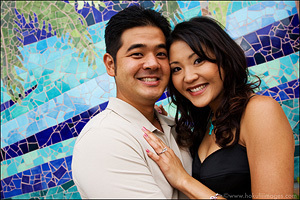 I decided to start shooting them in one of my most preferred towns - Kailua! Kailua Town is so hip and pretty! The town features so many shopping areas and restaurants. You could spend a whole day just walking around going from shop to shop. Most of them are locally owned! It turned out that, despite the lack of water, we still kept the flow going! I couldn't have asked for a better situation!!! 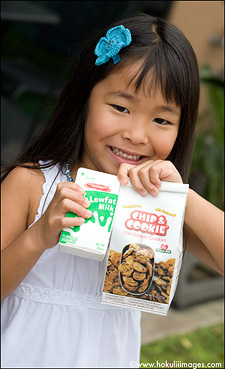 A few doors away from the fountain is Famous Amos' Chip and Cookie! How convenient is that! After Teylie had a few mini cookies and a sip of her milk, we proceeded around the corner where there are these groovy mosaic walls. These walls have an island theme to them. The artist who did this project is brilliant! I managed to shoot off a few frames before Ilima and I started cracking up! I don't even remember what the heck we were laughing about but I know that it was pretty darn funny. In fact, that was the theme for the whole afternoon! Lots of laughter!!!! During my shoots I'm always watching the light. I love to shoot with available light! I love my lighting to be like my peanut butter - ALL NATURAL, baby!!! I noticed that the light was getting slightly dimmer which signaled to me that it was time to leave Kailua Town and proceed over to our second location, Lanikai Beach. Of course, you know where I started off first right? Yes, that cool yellow wood fence!!! And it totally matched Ilima and Derek's attire!!! Okay, now here's another good example. On my shoots, whether it be a wedding, piko, etc., I shoot everything in color. However, like the above color image, you can turn any of your color images into a sepia or B/W image. In your proof catalog you will find some images converted but I will always leave the color file for you just in case you'd prefer that particular shot in color. In this particular example I think it works in both color and sepia. After the fence shoot we headed for the beach. As you can see, everyone was having a great time! Then, Teylie was dismissed to play in the sand! Again, I kept the original in their Proof Catalog just in case they like this long shot. As you can see, you can get really creative with just a bit of cropping! What I really enjoy about the Pililaoha session is the time I get to spend with my couples. During this time I get to know them better and how they are with each other through my lens. I appreciate that Ilima and Derek really got it. And for a few moments, they were able to be just "Ilima & Derek..."
I dedicate this post to Ilima and Derek. 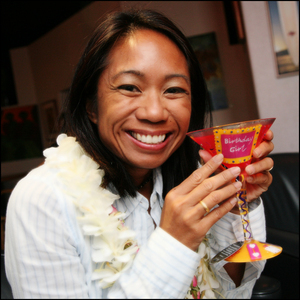 MAHALO so much for sharing your joy, laughter and affection for one another! I get goose bumps just knowing how fortunate I am to be the one to document your special moments on your wedding day. I look forward to having tons more fun with you, your 'ohana and friends in June. THANK YOU for entrusting me to document your start together as husband and wife. My love and gratitude goes out to the both of you!!! And to Ms. Teylie, you worked it like a ROCKSTAR, kiddo! Auntie G looks forward to seeing you again! Thank you for your smile!!! Before my wedding day at Ihilani began, I had my first highlight of the day. My sister and I stopped by our very favorite auntie's home to present her with a very belated Christmas, Birthday, Mother's Day (2007), pre-Mother's Day (2008) gift. My sister and I were raised with my cousins. It was sooo cool to suddenly have all these brothers! Josie, the eldest, is like our older sister, and of course Divina...let's just say that the three of us are pretty dang close. Lots of good times together, right casin? 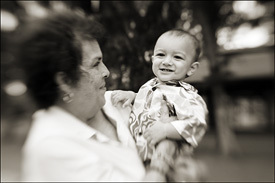 I photographed my cousins and our aunt in February of 2007. This was a big ordeal trying to organize this photo shoot due to everyone's conflicting schedules. Thanks to my darling cousins, Divina and Richard, the youngest of this pack, we were able to nail down one day to do this historic shoot. 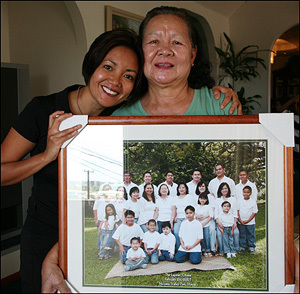 In true Filipino tradition, I come from a wonderfully large family. Let's just say that my mother is one of 13 children in her family. 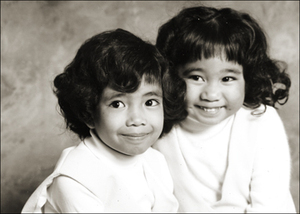 She was the youngest girl and her brother, who's family I photographed, was the youngest boy. They're both gone now, however, look at the marvelous legacy that my Uncle Maning has left behind!!! 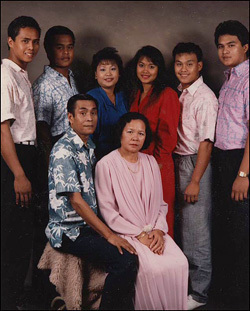 This post is dedicated to my Uncle Maning's wife, our dearest Auntie Pipay, who looks like she's still in her thirties, has raised an incredible family, continues to lovingly help raise her grandchildren and ALWAYS has time to unconditionally nurture other family members like my sister and I. We love you Auntie Peeps! Thank you for always supplying us with your delicious adobo, pinakbet, chicken & papaya, etc. whenever we have our filipino cravings!!! 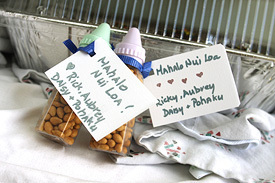 MAHALO, Andrea, John and Landon! My most favorite persons to document have got to be our keikis. Infants, toddlers, Pre-K, whatever! They are just so dang cute!!! And always unpredictable! I love that they are who they are right then and there. Their moods are dictated by simple things like food, toys, sleep. That's it! Very simple! Their needs are simple! I loved shooting Andrea, John and little Landon. 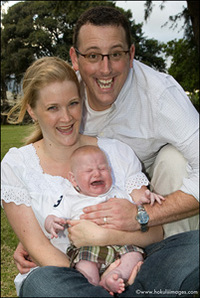 Andrea and John didn't expect Landon to be "the perfect smiley" baby. They allowed him to be...Landon. This is a real moment right here! 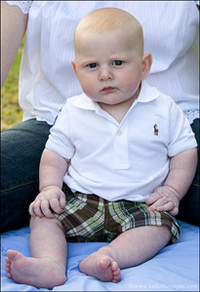 At that very moment, Landon didn't want to be a happy, smiley little guy. This is his reality and I RESPECT & LOVE IT!!! And so did his parents! 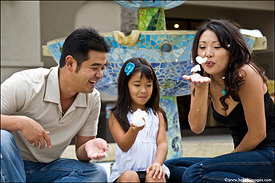 I advise parents NOT to expect perfection on a Piko or 'ohana shoot. Sure, we'd all love to have it! But like life, it isn't all perfect. We just need to just enjoy the moment and have a good time! Special MAHALOZ: To my favorite Carrot Cake Buddy, Ms. Carol! 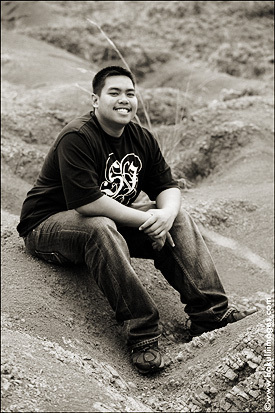 Thank you for entrusting me to photograph your dear friend's 'ohana! Like you, they are wonderful!!! Lub-lub!!! Last week, I got to meet a very handsome little Hawaiian. This little apple does not fall too far from the tree since his beautiful parents are Tiare and Jaime. I had the honor of second shooting at Tiare and Jaime's wedding back in 2003. They've both created this precious little boy who will be turning ONE in June of this year! It's so cute to me how kids at this age are fascinated by the simple things in life like...grass! We sure do take it for granted that we are all surrounded by these beautiful simple gifts that God has blessed us with. It takes our little ones to remind us how wonderful our world really is!!! Alika was extremely cooperative despite the windy morning at Kailua Beach. I'm sure it helped that his grandma was also present to make him smile. Congratulations, Tiare and Jaime!!! 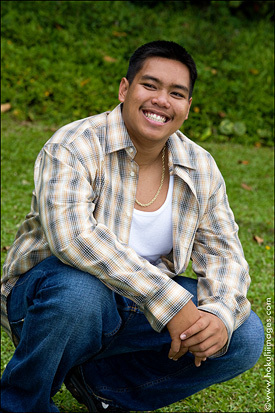 Another handsome Hawaiian to make all the little girls smile!!! I received a call from one of my brides the other week. She explained to me that her parent's little grocery store in Waipahu was being demolished in several weeks and her father really wanted a nice photo as a tangible remembrance. This little neighborhood store has sat in that location for more than 70 years! It had been owned by several families over those 70 years, hers being the last. She said that this store meant so much to her parents. They worked very hard to maintain it and to serve the community. Her mother has since passed on, her father has retired and now, the Nabarrette Store will cease to exist. 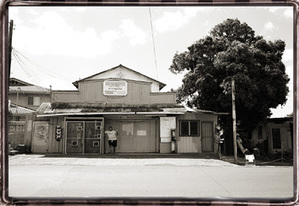 The Nabarrette Store symbolizes so much of old Hawai'i. Now they've been replaced by 7-11s, Fast Stops, or other mega mundo franchised convenient stores. As I photographed this aged building, Mr. Nabarrette asked me to make sure that the mango tree beside her was included. He said, "because they always go together." I understood. Just as those keikis and their childhood memories of growing up on Waipahu Street will always remember the Nabarrette store - "because they always go together..."
Kailua is one of my most favorite towns on O'ahu. It's so versatile! 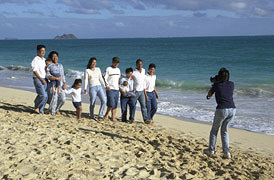 The beaches, including Lanikai, are not as crowded as Waikiki which makes it so ideal for shooting. Valentine's Day is not only a day of love for the world but also, on a personal note, my parent's wedding anniversary. I don't know much about their wedding day or even how they met. And Happy Valentine's Day to all of you! Spread the LOVE!!! Some of the best people I know are Aquarians and Pisces Peeps. I've found that those born in the month of February are really cool people! It is the most busiest month for celebrations. This month would also include my mother and father's wedding anniversary on the day of love - Valentine's Day. My sister, Daisy, our dad, and our good friend Grant are born on the same day! February 11th!!!! Happy Birthday to all cool Aquarians!! !